Satellite virus: The virus needs a helper virus for viral replication. 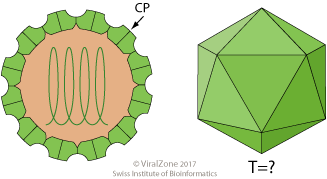 Infection requires host cell to be co-infected with a virus from the genus Aureusvirus, family Tombusviridae. Non-enveloped, spherical, icosahedral, about 17 nm in diameter. Linear, ssRNA(+) genome of 1.2 kb, which lacks a cap structure and a poly(A)tail. The virion RNA is infectious and serves as both the genome and viral messenger RNA. Encodes one capsid protein. ETYMOLOGY Aumaivirus: from type species being satellite of Aureusvirus maize white line mosaic virus.